Beyoncé introduced her new activewear line, Ivy Park, on Thursday -- and it's caused some friction with Lululemon. 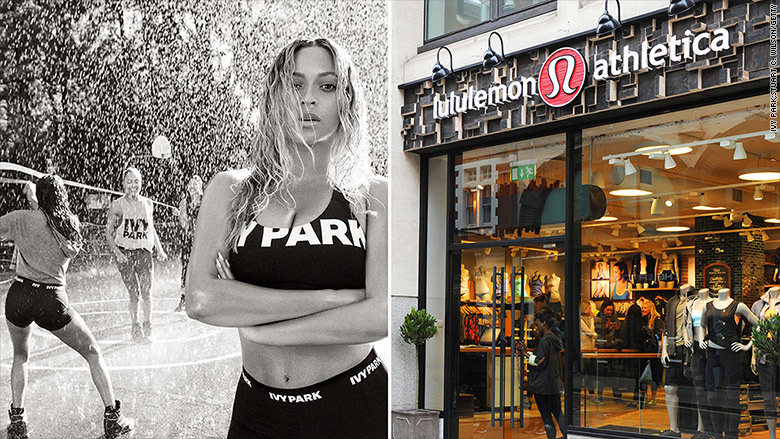 Lululemon (LULU), a Canada-based clothing line that specializes in yoga gear, responded to a tweet Thursday asking if Ivy Park was intended to "be like Lululemon." "They do say imitation is the best form of flattery. Maybe Beyoncé is so Crazy In Love with our brand, she made her own," Lululemon wrote in a tweet that was later removed. The company indicated it's not worried about the pop legend's activewear taking a bite out of Lululemon's market share. "[Y]ou won't find us six feet under. We love a little competition, especially with the Queen B," the company tweeted. A screenshot of the Tweet later removed from Lululemon's account. Those comments sparked a barrage of angry tweets from Beyoncé fans, who refer to themselves collectively at "The BeyHive." "You realize the mistake you've made right? 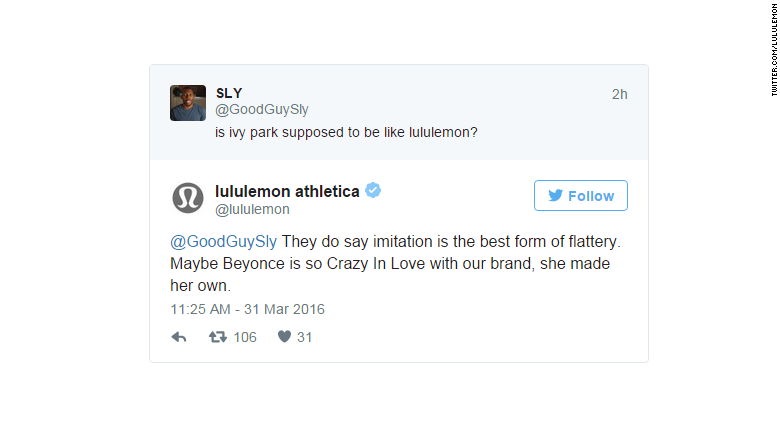 The #beyhive never forgets," one user tweeted at Lululemon. Lululemon, stung by the reaction, insisted their remarks were in good fun: "[W]e didn't mean any harm. We're huge fans," one tweet says. @sailorpandaxo No harm meant, we're big fans. Ivy Park -- which will be available April 14 at TopShop and Nordstrom stores as well as online at Zalando.com -- is the result of a collaboration between Beyoncé and TopShop. They teamed up in October 2014 to develop a "global athletic street-wear brand" that would "encompass clothing, footwear and accessories across dance, fitness and sports categories." Lululemon declined to comment on the back and forth with Beyoncé fans. TopShop and Beyoncé representatives did not immediately respond to requests for comment. @RadiantTiffani Hey now, you won't find us six feet under. We love a little competition, especially with the Queen B.